Hello again! The course in Switzerland was brilliant. It was an action-packed ten days but I wouldn’t have missed it for the world. I had great energy when I got back but it all caught up with me at the weekend. Anyway, I’m back to my old self today. Before I went away, I started drafting a basic bodice pattern. 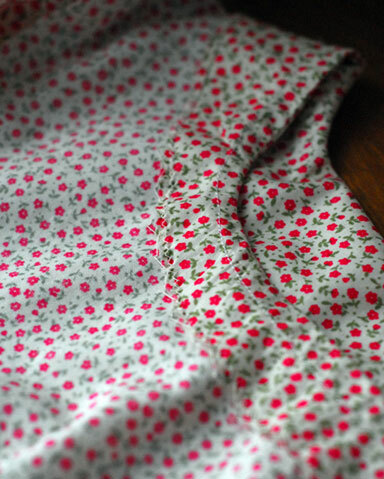 I had a metre of some pretty flowery cotton that didn’t cost me very much and thought it would make a good experiment. I got as far as tracing off the front and back and making up a muslin. It needed a few adjustments so I left it to another day. Yesterday, I got the muslin back out, put it on and used a soft pencil to mark in a few adjustments: lower and widen the neckline and move the darts. 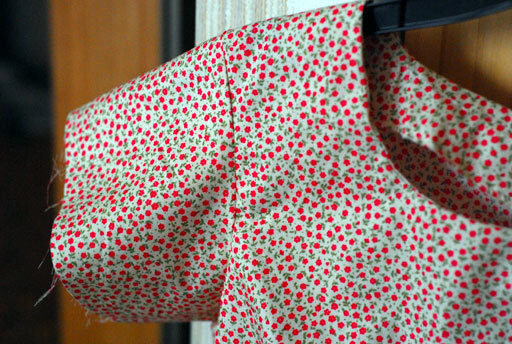 I adjusted my pattern pieces and made up another muslin. Much better. 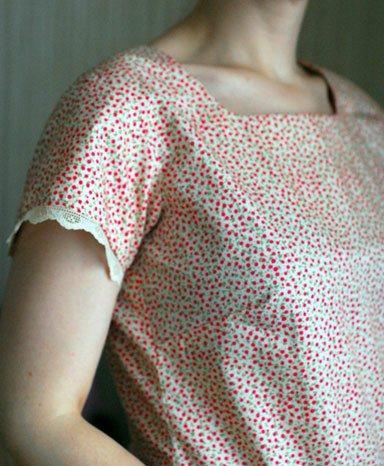 Another quick adjustment to the neckline and I was ready to cut it out of my fabric. While I was laying out my pieces – and boy, was it tight! – I thought that I should probably consider facing the neckline. 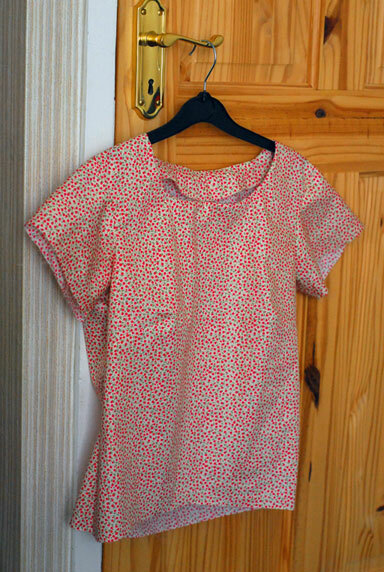 I had thought of just popping some bias binding on the neckline and armholes but where’s the fun in that? I used my front and back pieces to trace off some facings and laid them out with the other body parts. This in itself was great practice. 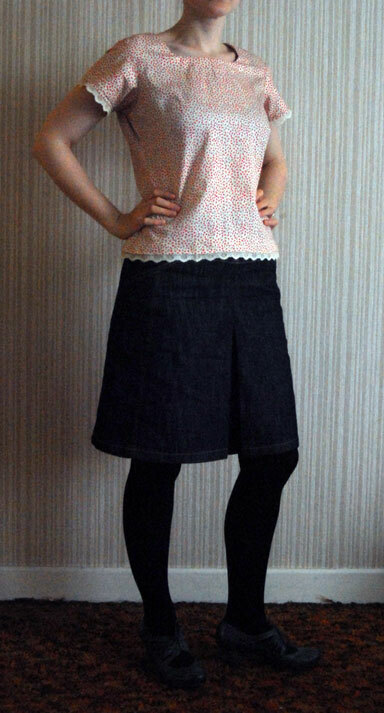 My facings fit perfectly but my 5/8″ seam allowance made life a bit tricky around the curves. Next time, 1/4″ would probably be better. I found notching around the curves helped a lot and the facings lie flat when I have it on. I stitched them to the seam allowance and then just zig-zagged the edges. That was all quite straight forward and something I had had some experience with before. But drafting a sleeve cap? That was new territory. I understood the theory from knitting, of course, but it was very interesting to go back to my original draft and trace off what I needed for the sleeve. Shoulders are most peculiar! For a start, it looked far too big so back I went to my muslin and tried it out. It fit perfectly! But it was a bit baggy at the underarm. So for the second muslin sleeve, I lopped off what I thought needed to come off, but it affected the circumference of the armscye too much and it didn’t work. I didn’t have any more muslin left for another sleeve so when I cut out the pieces from my fabric, I left the armscye circumference the same but reduced the width of the sleeve immediately after that. For the most part, my notches fitted together. All that remains now is to hem the body and the sleeves. The body is on the short side because I was restricted by how much fabric I had. 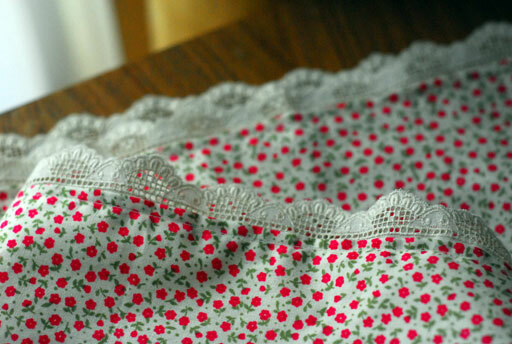 I was thinking it would be nice to hem it with an extra strip of lace to lengthen it a little. PS: I should probably add that there is no way I am pulling these patterns out of the air – I bought this book a while ago and find it fantastic. Quick one for the weekend! 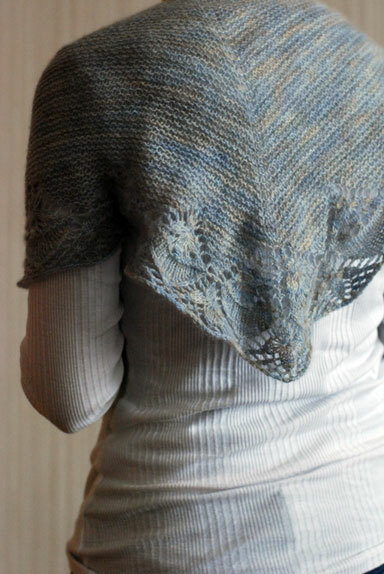 Pattern: Celaeno from Romi’s 7 Small Shawls to Knit. I’m not a huge shawl knitter but I want to knit all of these. Yarn: Cashmere from Hedgehog, one skein. 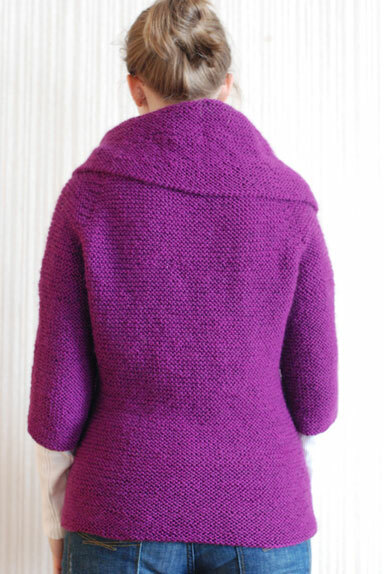 I loved knitting every single stitch of this. 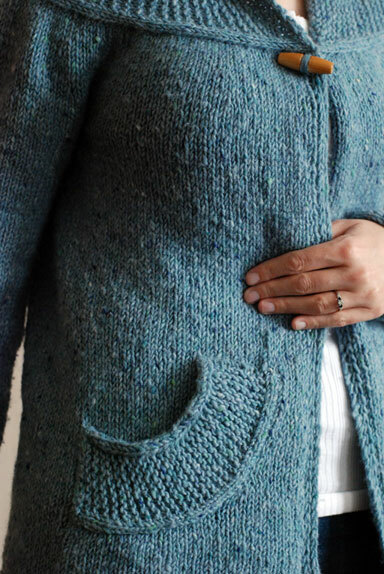 Really, it was all about the yarn: the subtle changes of colour, the texture, the fibre. It was perfection itself. And it wears fantastically well. I wear it all the time with my coat on the bike and despite rain, hail, wind, sweat and the occasional distracted nibbling, it looks like new. By the time you read this, I’ll be in Switzerland on a piano course. I hope to be in a position to post some pictures but if not, I’ll be back on the 20th, exactly one month before we get married. Squee! 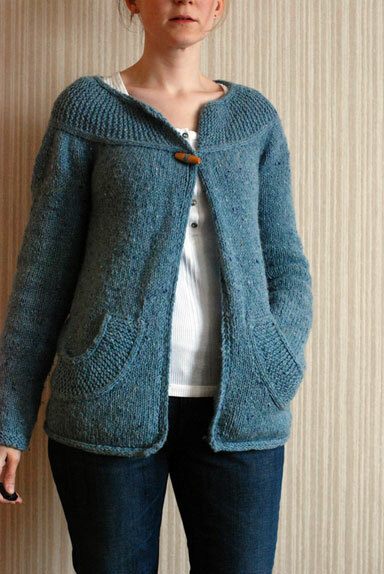 Yarn: Aran Tweed by Debbie Bliss, 10 balls. This stuff is deep stash. 2006 deep stash. It was glad to be finally knit. I couldn’t figure out how to stop the front from drooping forward. 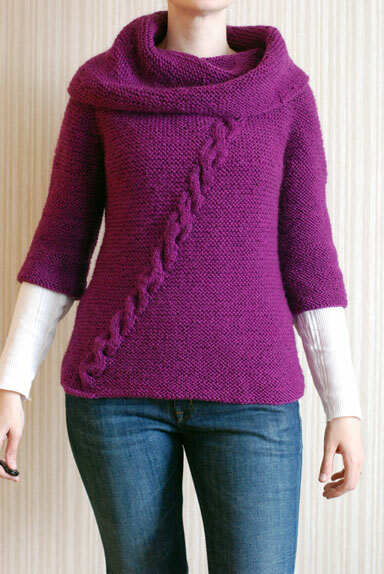 I crocheted around the neckline and that helped a lot. 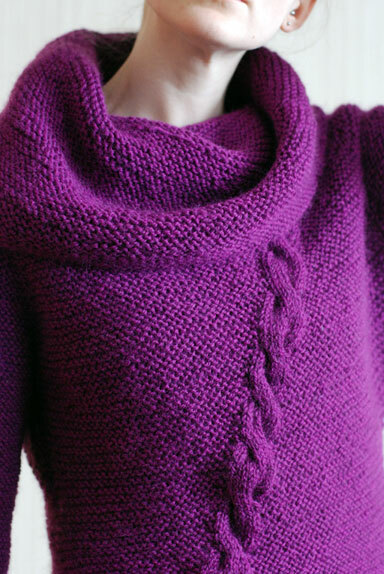 Maybe I knitted the garter yoke just that little bit too loosely. Otherwise, the fit is perfect for that weekend sweater. And pockets! Oh, the pockets. I’m not going to lie. They were a pain to knit and put together, but they were worth it! 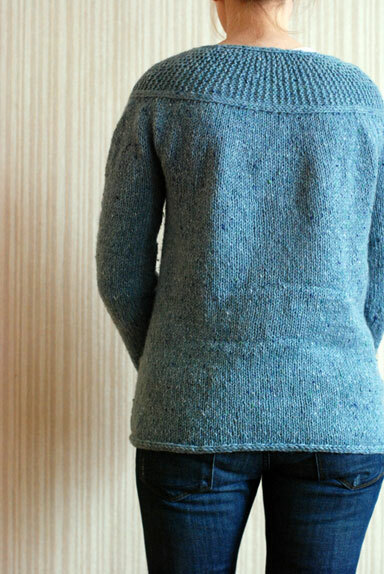 Pattern: Graystone Sweater from Veera’s Book of Gray. Yarn: Brown Sheep Nature Spun Worsted, 5 balls (1120m). This was a really straight-forward knit. As always, the pattern was clear and easy to follow. Mostly, the garter stitch afforded wonderful mindless knitting but resulting in a gorgeous lap-blanket as you worked. I had planned on making the sleeves longer but ran out of yarn. I think it still looks ok with a long sleeved top underneath. The only thing I’m not crazy about is the depth of the armholes. I have a very short armscye so I should have compensated. It looks a bit droopy. Otherwise, though, I will definitely be reaching for this come October!